As the title suggests, today is indeed Official Roald Dahl day, which takes place every year on the birthday of the World's No. 1 Storyteller. 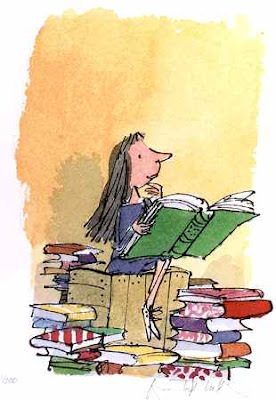 We have fond memories of reading Dahl's great stories and, of course, looking at Quentin Blake's fantastic illustrations that brought all the characters to life. There was really something quite magical about flicking each page and not really being sure what was going to happen next. We can't have been the only ones that always dreamt of trying an 'Everlasting Gobstopper'. What's your favourite Dahl book? Hello, how’s it going? Great blog! Love Heels?? You should definitely check out my new shoe design BlogSpot! All my designs are hand-drawn too! I saw that you’re from the UK-So am I; I live in Leicester how about you? I can't say!!! I like them all. :P Suppose if I had to choose... The Twits and Fantastic Mister fox? I loooved the Twits, but also Fantastic mr fox, must have read it ten times when I was a kid!